KANSAS CITY, Mo. 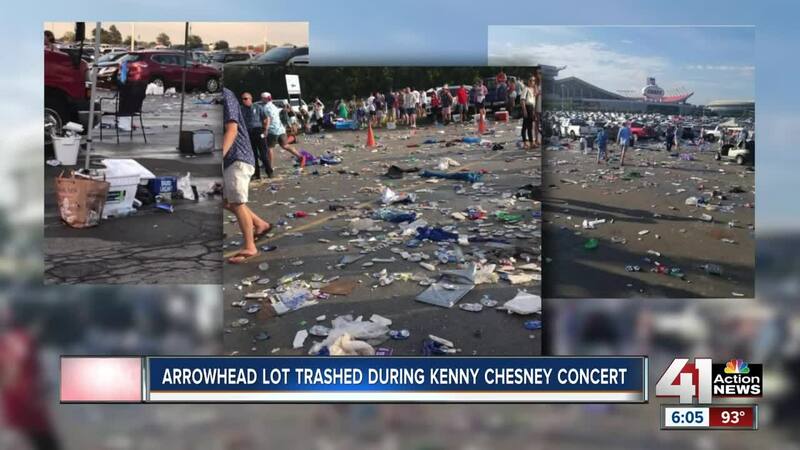 — Some Kansas City Chiefs fans were upset that Arrowhead Stadium's parking lot was covered in trash following a Kenny Chesney concert on Saturday. Beer cans, coolers and clothing were left behind. Chiefs executives said that the amount of trash was the same as the aftermath of a Chiefs game. But some Chiefs fans saw the parking lot pictures and reacted on social media with anger. In 2016, Pittsburgh reported a problem with excessive trash and unruly fans following a Chesney concert. Two years later, in 2018, the Pittsburgh police increased police presence at the concert and the amount of trash and the number of people arrested both decreased. Executives at Arrowhead Stadium have no plans to add any additional security because they said that the trash was not excessive.